The new edition of Regio-news highlights the current topic of monitoring spatial changes and its impact on future development activities. 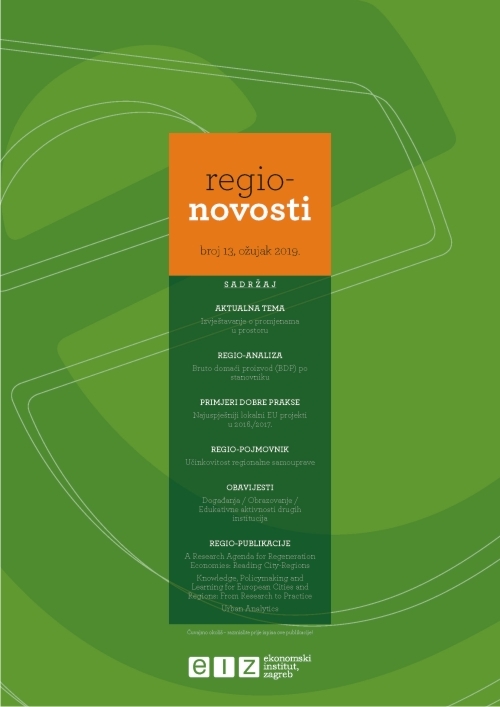 It brings an analysis of GDP per capita for the Croatian NUTS2 regions and counties in 2016, and reports on the most successful EU-funded local projects in 2016/2017. It also explains central concepts related to regional performance. In addition, Regio-news announces upcoming events, training, and educational programs and reports on new reads on the topic. Regio-news is published with an aim to share knowledge and information in the field of regional development, and encourage region-wide cooperation between scientific, professional, and broader audiences.